Dimension printers 3D, produced by USA based company Stratasys, are a brand of 3D printers providing computer-aided-design users with a comparatively affordable, networked tool for building functional 3D models straight from the desktop. The Dimension 3D printer builds objects layer-by-layer with ABS plastic. 3D printing allows users to evaluate design concepts and test models for form, fit, and function. 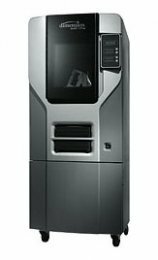 The Dimension 3D Printer, and Stratasys Fortus 3D Production System, both employ Stratasys patented FDM technology (Fused Deposition Modeling), utilising ABS plastic (one of the most widely used thermoplastics in today’s injection-molded products). Stratasys invented its patented FDM technique in 1988 and have been at the forefront of 3D printing technology ever since. Dimension 3D printers are used by many leading companies like Black and Decker, Segway, John Deere, Sony, Duracell, General Motors and Electrolux amongst others.